PADDOCK LIVERY: €360 Includes ad-lib forage up to 12kg daily. Prices are per horse per month. Please do not ask for a discount for two horses or more. They do not eat less or poop less. The horses live in herds (not two horses in a corral, a number of horses in a paddock) and their wellbeing is paramount. It is apparent when you see our herds. We find it is the owners who are unable to adapt to a natural environment, not the horse. So if you are likely to have a meltdown should your horse get the slightest scrape, then our livery is not for you. Our hard feed is non-cereal based fully balanced mix prepared especially for us by a leading Spanish manufacturer dedicated to horse feeds and is fed according to the needs of the individual - price upon agreement of feeding requirements and schedule. Individuals are catered to as and where necessary. To livery your horse with us it must be vaccinated against tetanus, have a minimum of Civil Responsibility Insurance and be up-to-date with a worming schedule. We do not habitually worm here, rather we do counts on our horses and worm if necessary. NO SPACES AVAILABLE FOR NOW, BUT PLEASE CONTACT US FOR FUTURE POSSIBILITIES. Some clients are only with us temporarily whilst their hooves and/or body is going through rehab. Ad-lib hay means just that. 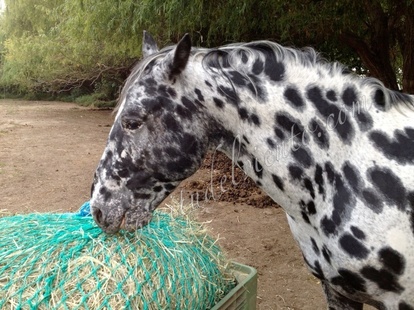 You horse will always have forage available 24 hours a day. Just as nature intended for them to eat around 16 hours a day, so too they can at our yard. Happy horses, being horses. So you may need to brush a little more, but that´s a small price to pay when you have a calm, healthy equine.